This entry was posted in In a Vase on Monday and tagged arranging flowers, cut sunflowers, drying sunflower seeds, flower arrangement, in a vase on monday, long view, squirrels, sunflower seeds, sunflowers. Bookmark the permalink. Hurray for the long view *and* sitting with you for a cuppa. I adore that expression and plan to incorporate it into my vocabulary. The expression ‘natter’ is a good one, too. Perhaps if all of us bloggers pool our money we can buy a jet and go on a real blog hop. Wouldn’t that be fun? I’m glad you enjoyed the postcard. We had fun choosing and sending them and in many ways you were along for the trip. I certainly ate enough for two people. Ha! I love the long view – it is so welcoming and pretty and begs for company, giggles and a relaxed couple of hours with a few good friends! Close-ups are good too – sometimes it is nice to have both as it helps put things in perspective. That flower arranging thingy looks deceptively simple but I bet it does the job really well. I imagine you could bend it a bit to fit into a vase mouth if you wished? I haven’t seen such a thing here – but then I haven’t been looking either 🙂 It is almost time to start bringing fresh flowers inside again – I was just looking at my jasmine and she is full of buds. I love to have some sprigs scattered about the house in tiny containers. 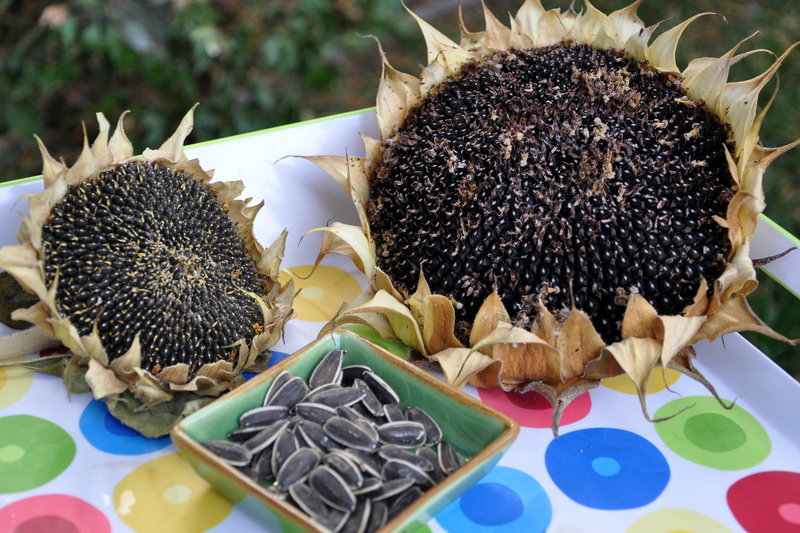 I am also pleased to see the squirrels and other assorted critters left you some sunflower seeds to enjoy. Is the heat beginning to abate now for you? I do hope you get some rain this coming autumn. Oh Pauline, you grow Jasmine outside? How fabulous. It’s one of my favourite scented flowers, not outdoor hardy hear but we see small topiaries sometimes at the market. 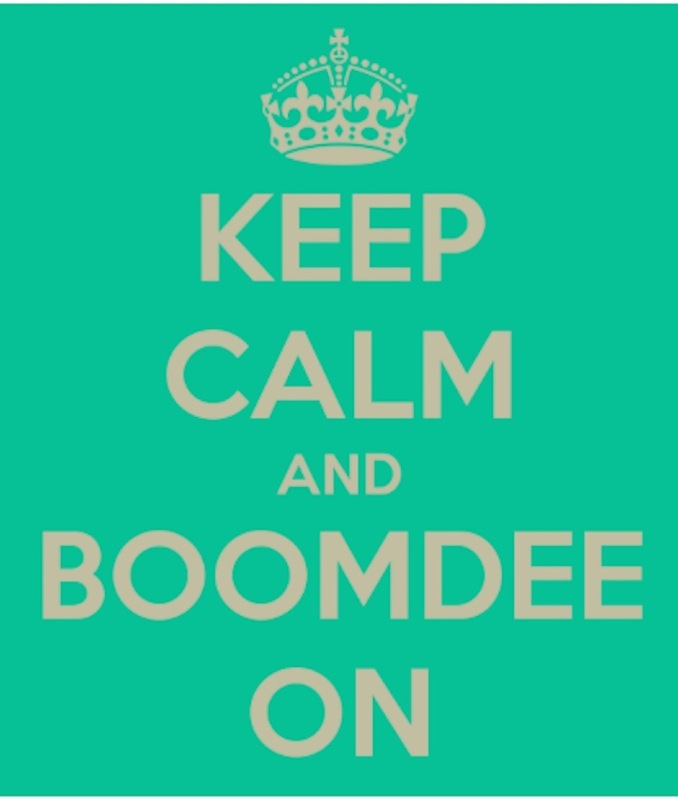 I do Boomdee 🙂 I have two vines here. One at the back door which was here before me and another in the tiny courtyard that I planted and which is well along the way to covering the ugly fence. It is almost considered a weed in this country it grows so easily and prolifically! The scent is said to be the aroma of the angels – I like that! Magical indeed! When do we leave for our visit? Ok, well there’s Washington, then San Jose, then Edmonton, then ? Hey, I think I see an opening xoxoxo Jim says he has to retire first? I don’t think I can wait that long. Have him give me a call. I’ll impart the urgency of our visit to all continents starting with the letters Australia and New Zealand. Mr. B., Operator Alys is standing by. It’s a huge trip, isn’t it? In fact, there are days when I wonder how I would survive that lengthy flight with all my neck and back problems, and my not-made-for-flying, legs. Like you, It will probably be a once in a lifetime trip as well. Mike has been twice, both on business. The first trip was grueling. He was gone for two weeks and covered both Australia and New Zealand. He took several flights across Australia, then two more flights in New Zealand. He lost his glasses and he lost his voice. BUT he loved the countries, the beauty and the people. So, I sincerely want to go, but all kidding aside, I know it will take careful planning. To meet Dani, Sarah, Pauline and others would be extraordinary. I could smell it all day. It’s intoxicating. I love that you’ve nearly covered your fence. I can’t wait to see this year’s garden, Pauline. Hurray for the long view. It’s been unanimous, which has actually surprised me. I’m thinking of featuring a long view in several posts. I wish I had Boomdee’s skills to make them look like a postcard. I have the idea in my head, but don’t have the software or skill to execute. I will see what else is out there. The Easy Arranger does bend to fit and it stayed in place all week. The flowers are just now dropping petals so I took it apart. I’m happy to hear that your spring and summer are ahead of you. I don’t know why I never think to bring it sprigs of Jasmine. What a good idea. That smell…oh my goodness. It’s still pretty warm here and no rain in sight, but that’s no uncommon for September and even October. We may get some rain in late October. Fingers crossed. Thanks for sharing your perspective. It seems we’re all curious to see the broader picture, the long view. I hope we meet one day and if it’s in one of our gardens, all the better. I’ll try to arrange squirrel entertainment in advance. Sorry to hear the Easy Arranger’s are so pricey in Germany. I’m thinking of buying a few here and hosting a give away. Stay tuned. Love the vase, maybe your shorter sunflower lost its growing tip and so bushed out to produce more flowers; As I’ve been picking mine all summer (well since June) they keep producing more and more blooms down the stems. I think that I disagree about close-ups being the best pictures; they are good too but it doesn’t give any idea of how a garden actually looks. I think you need both to understand what works and to understand a garden you’ll never see. Christina, that is exactly what happened. I just didn’t know that was a possibility. The flowers lower down are quite different. They have an almost black backing, unlike the typical green, and they are growing in multiples directly from the main stalk. Nature amazes me every day. Thanks for your comments on the long view. It’s been great reading all the perspectives. Curiosity moves us forward each day, so that, my friend is a wonderful thing. Nosy has negative connotations…but we’re all nosy in our own way. I think the difference is recognizing boundaries. If someone says ‘would you like to see my garden’ the answer is YES! But if not invited, and even though I want to, I would never insist. I’ve wanted to grow a cut flower garden for years, but with my limited space, I just tuck things in here and there. I do get nice daffodils int he spring, Cosmos and sunflowers and white Japanese anemone right about now. It keeps me satisfied. I’m going to have to purchase one of those Easy Arrangers. How great is that! 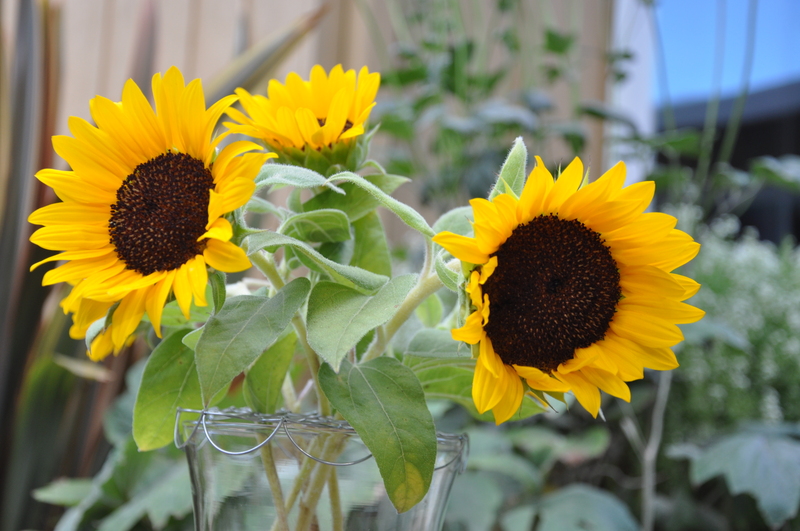 My friend’s transplanted sunflowers were a complete fail, but I will do better next year! 🙂 Yours are so fun and beautiful and bring such happiness! Aren’t those Easy Arrangers fun? They’ve been quite the hit. I might just order a few more and host another giveaway. Stay tuned. Bummer about your sunflowers, but never give up. Years of gardening taught me that every year is different. Thanks for voting and for sharing your perspective on the long view. So far it’s been unanimous. La la la, don’t mind me, just cutting thru the garden…LOL, love the big picture because I can absolutely picture us there, chit-chatting away. Then, there’s Mighty Mouse running out, full tilt, to join us as Lindy’s snoozing on the warm patio. Slinky’s half hidden in the corner, but those widdle black toes are just visible from behind the generous watering can. What I can quite see, I’ll imagine 😀 and as long as you’re there to spend time with, it’ll be the best day of the week. I do remember you buying the vase arrangers at the gift shop, so cool to know they work so well. That was a pretty good shop. I can’t believe I only bought Blue Poppy Seeds. I spotted the coleus that graces your new art work. It’s looking amazing, talk about long living. I’ve never included it in my planters, maybe I should. You describe a probable scenario so well. Slinky in the shadows, Mouse front and center. Wish you were here today for a chat. I loved that shop! Lots to see and admire and everyone there so warm and helpful. I guess knowing we had to cart our purchases around for the rest of the day slowed us down. I would have loved to buy seeds if I was aloud to bring them home. That said, its possible they were better zoned for the coastal area. The packages were stunning. It’s nice to garden year round, though like many places, spring and summer still reign. I’ve ordered some cover crop seeds to keep the vegetable beds fortified, and I’ve made some leeway on the lawn too. Stay tuned for more on that. I’ve heard mixed things about seeds. My friend Liz, who also lives and gardens in New Zealand, says they confiscate any seeds or even dried flowers on a card. You can pay to have them fumigated (ah…no thanks) or they simply destroy them. Importing foreign soils, pests or invasive species are always the fear. Oh, I know all about buying more that you can handle at garden centers. I’m worse than a kid in a candy shop. The alums sound beautiful. I love buying bulbs at Costco, but I’m always so tired when I leave that place. It’s cavernous, crowded and the floors are hard and unforgiving for lots of walking. Forcing them in pots sounds like a good plan. 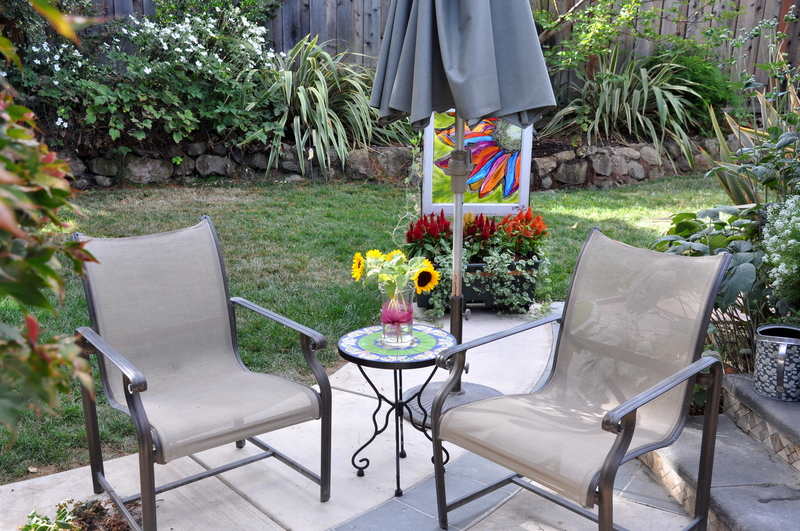 I love that flower painting on the glass as it makes a nice statement in the backyard, not to mention, I love how it adds instant color! I bet it looks beautiful when the sun hits it! I do love your close-ups, but seeing the whole picture always is wonderful. A close-up is good for showing us detail, but seeing the whole picture of your backyard also shows how much more beautiful it is and a place where I could find myself calling “home”. I wish I had something this beautiful to enjoy! I love that painting too. It’s painted by a local artist and theater owner. We connected via Facebook and mutual friends, but met for the first time when I bought the painting. I love it. It is so ‘me’ as they say. Your place is beautiful too. And all that space! Love it. That piece of art is definitely YOU. 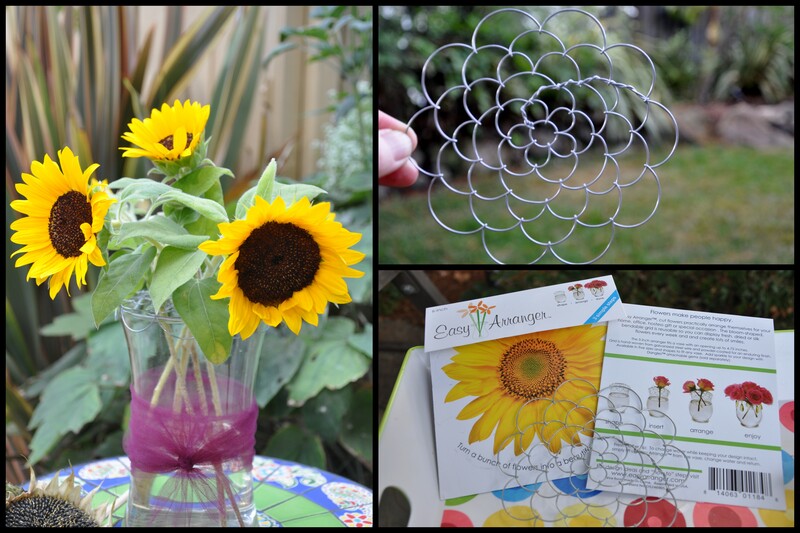 I would like to make a piece of art and use different sized metal circle cookie cutters then melt the pony beads in them. Then I would overlap them a little and glue them in place, then attach them to an oversized wood frame for display. I saw something similar like this and I thought it was the neatest thing. I could see myself doing this! As for you saying that my place is beautiful, it is NOT MY place, it is my boyfriends house. I own nothing. I can almost picture what you’re describing. I hope you’ll do it. It sounds both interesting as a finished product and fun to do. Yep, it is his house. I do make it a home with all that I do! Wow! That is gorgeous and way more detailed then I pictured. Super cool. Thanks for the link. I try to stay away from Pinterest or I would never get a thing done, but I am following you. Thank you! You made me smile. You are a genius at capturing that photogenic squirrel. Love the flower arranger. They look quite handy. Your views are good anyway we get them. Of course I could have done without the millipedes. Yuck. Did they send them back to Germany? 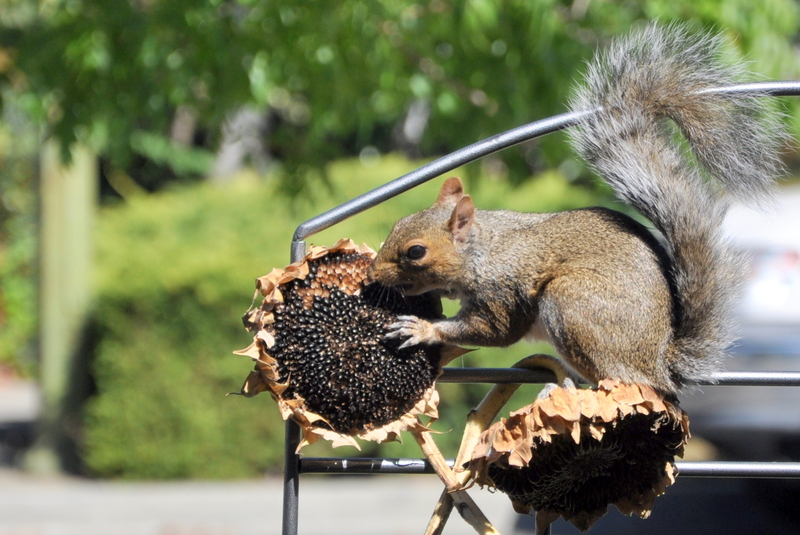 Oh Marlene, during sunflower season, the squirrels make it easy. I plant the camera on the kitchen counter, and frequently get lucky. Then I just click away through the glass. I’m glad you enjoy them as much as I do. I don’t imagine they send things like that back. They’re probably immediately quarantined to be sure nothing else came through with them. Oh, no, I love the long view, as you call it. Different perspectives is what it’s all about. Although my fave pic is the squirrel eating the sunflower, of course. He/she is pretty darn cute, I agree. Thanks for the feedback, Gjeo. So far, it’s unanmious.